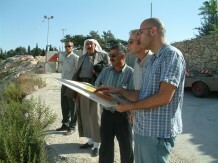 Haaretz: April 11, 2016 Despite well-documented adverse affects reported on by Bimkom of the proposed plan to relocate the Abu Nuwar community to Al-Jabal, on the outskirts of Al-Azaria, government officials continue to argue that the plan represents a positive development for the current residents of Abu Nawar. Read the article here. 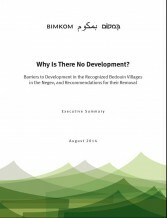 Why Is There No Development? Of the Bedouin villages in the Negev, only 12 (one of them just recently in 2014) have been recognized by the government. The government planning process for the recognized villages has largely ignored their spatial reality and its logic. In practice, only 128 residential building permits were issued in only two villages.